USDA Certified Organic. Refresh skin with a potent cocktail of super-charged antioxidant-rich Acai & Ginkgo Extracts which help revitalize skin and quench dehydration. Purifying Lemongrass & White Willowbark Extracts target congested pores. The perfect non-greasy and light moisturizer for oily or acne prone skin with a dynamic combination of therapeutic ingredients. Eucalyptus, Olive Leaf and Tea Tree Oil help to detoxify, heal and hydrate skin. This marine derived calming gel provides exceptional hydration and soothing properties which calms sensitive or irritated skin. Anti-oxidant Green Tea and Gotu Kola Extract fortify skin against environmental stresses that cause sensitivity. Blueberries help the body manufacture collagen which makes the skin supple and smooth. Using the Pure Blueberry Night Cream will help boost hydration levels making skin feel incredibly nourished! Swiss Apple Stem Cells boost cellular longevity and proliferation, boosting resistance to free radicals and sun damage which often contribute to the appearance of chronological aging. Pamper skin with this luxurious moisturizer that targets visual signs of aging by fortifying the skin’s natural moisture barrier. Microscopic lipid spheres comprised of highly purified natural safflower encapsulates enhance delivery of active ingredients. SHIR-ORGANIC PURE APRICOT MOISTURIZER - 1.7 oz.- Normal to Dry Skin - Absorbs Easily, Improves Elasticity - SHIRA TOP SELLER! Apricots are rich in Vitamins A & E, as well as Linoleic acid, which aid in the prevention of free radicals to keep your skin looking young and healthy. The Pure Apricot Moisturizer contains rich apricot oil which easily absorbs into the dermis. SHIR-ORGANIC PURE GRAPEFRUIT MOISTURIZER - 1.7 oz.- Normal to Oily Skin - Clarifies, heals, oil control - SHIRA TOP SELLER! Grapefruit is rich in vitamin C. One serving of grapefruit (1/2 grapefruit) contains 78.1% of the daily recommended allowance of Vitamin C! Vitamin C improves collagen production and reduces skin damage caused by free radicals. USDA Certified Organic. Protect and maintain elasticity and fortify DNA defense with this light, daytime hydration creme which helps skin feel ultra-soft, silky smooth and supremely supple. USDA Certified Organic. Infused with Red Raspberry Seed, Seabuckthorn and Rosehip Extracts plus tropical Mango butter, this antioxidant rich Night Creme is high in Vitamins E & A, essential fatty acids & antioxidants, which encourage healthy cell renewal. USDA Certified Organic. Boost natural hydration levels and fortify against environmental aggression with this fabulous Omega 3 and 6-rich Serum that is excellent for those who desire suppleness and a silky texture without stickiness. The rich benefits of Pure Revitalizing Pomegranate Serum will actively aid your skin’s own ability to regenerate itself, and help reduce signs of aging while deeply moisturizing. Pomegranates contain antioxidant-rich ellagic acid and polyphenols. SHIR-ORGANIC SELECT PURE BASIL & BERGAMOT EYE CREAM - 1.0 oz.- Revive Tired Eyes - SHIRA TOP SELLER! USDA Certified Organic. Revive tired eyes with our fast-absorbing, hydrating Pure Basil & Bergamot Eye Treatment which contains Jojoba, Basil and Brazilian Babassu Oils which condition and hydrate skin. SHIR-ORGANIC PURE CUCUMBER EYE CREAM - 1.0 oz.- Hydrates, Reduces Puffiness & Irritation - SHIRA TOP SELLER! Cucumber is one of the vegetables that works wonders for your skin. The cucumber and skin share the same level of hydrogen making it the ideal ingredient to cool, soothe, and calm skin around the eye area. USDA Certified Organic. Pamper, firm and protect with this luxurious creamy mask bursting with natural source emollients and antioxidants that help to restore hydration and resist oxidative skin damage. Restore equilibrium and calm irritation, while protecting the skin from premature oxidation. An excellent treatment mask for those who experience hyperpigmented or dull-looking skin. Dull looking skin will appear more radiant due to the high content of Bioflavonoids, Vitamins, mildly exfoliating Alpha Hydroxy Acids and plant derived oils. Blueberries are one of the most nutritious and powerful super-fruits due to their high levels of phytochemicals, antioxidants, Vitamins C and E. Blueberries are also full of amino acids, vitamins, and essential fatty acids. SHIR-ORGANIC PURE CHERRY CLAY MASK - 1.7 oz.- Problem & Oily Skin - Tones, Balances & Minimizes Pores - SHIRA TOP SELLER! Add this “superfruit” to your skin care regimen to help tone, balance, and minimize pores for a more youthful, refined appearance. Cherries contain melatonin, an antioxidant which guards against the breakdown of collagen. Purify and balance eruptive skin with this clay-based, oil-absorbing treatment mask. Salicylic Acid combats topical bacteria and blackheads commonly associated with congested skin. SHIR-ORGANIC PURE MANGO BUTTER MASK - 1.7 oz.- Replenishes Skin’s Natural Moisture Level - SHIRA TOP SELLER! Cupuacu Butter, rich in phytosterols, is highly beneficial for dry, dehydrated or damaged skin. Mango Butter and Pulp enhance the natural moisture barrier, improving elasticity and anti-inflammatory activity. The Acai Berry is a small berry that grows in the Amazon rain forest of Brazil. Rich in essential fatty acids, Omega 3, Omega 6, Omega 9, phytosterols and Vitamin C, the acai has one of the highest levels of phytochemicals and antioxidants. AHAs are a mix of “fruity cocktail acids,” mostly derived from sugar cane, lemon, apples and grapes, which have extremely beneficial properties for the face and skin. These acids help clarify and polish the skin’s surface. SHIR-ORGANIC PURE PUMPKIN SMOOTHING PEEL - 1.7 oz.- Smoothes, Softens, Enriches - SHIRA TOP SELLER! Purified Pumpkin Pulp, rich in naturally occurring Enzymes, Beta Carotene and over 100 essential nutrients, works in synergy with Pineapple & Papaya enzymes to smooth and soften skin while providing it with anti-oxidant protection. Not for sensitive skin. Pineapple and Papaya are saturated with vitamins and enzymes that soften and heal the skin. The enzymes in these fruits fight free-radical damage and are known to reduce age spots and fine lines, leaving the skin supple. They also cleanse the skin. Loosens and dissolves devitalized cells revealing a more youthful-looking appearance. Flower derived acids improve barrier function and skin hydration, resulting in a more uniform skin tone. SHIR-ORGANIC PURE SHEA BUTTER & PEPPERMINT FIRMING BODY CREAM - 8 oz.- Increases circulation, replenishes lost minerals - SHIRA TOP SELLER! This highly nourishing formula rich in Shea Butter, Cocoa, Algae and Botanical Extracts is specially designed to increase circulation, replenish lost minerals and enhance skins hydration, elasticity and tone. SHIR-ORGANIC PURE EUCALYPTUS & COCOA ANTI-CELLULITE GEL - 8 oz.- Eliminates stored toxins & reduces cellulite - SHIRA TOP SELLER! This highly detoxifying formula, rich in essential oils, eucalyptus, ginseng and cocoa is especially designed to eliminate stored toxins and reduce cellulite by stimulating the lymphatic system and increasing blood circulation. SHIR-ORGANIC PURE CUCUMBER MELON BODY LOTION - 8 oz.- Soothes, softens & combats free radicals - SHIRA TOP SELLER! Cucumber and your skin share the same level of hydration, it is an incredible all natural ingredient to sooth and soften your skin. Melon is rich in Vitamin C which effectively combats free radicals in the body. All skin types. SHIR-ORGANIC PURE ALOE & GINSENG ANTI-FLUID GEL - 8 oz.- Highly cooling, reduces swollen feet and legs - SHIRA TOP SELLER! SOLAR ENERGY BODY LOTION SPF 15 - 8 oz.- From the Dead Sea Minerals, with anti-oxidants - All Skin Types - SHIRA TOP SELLER! Softens and restores a healthy level of hydration. Stabilizes the balance of moisture and refreshes. Protects the skin with Vitamin E Anti-Oxidants. 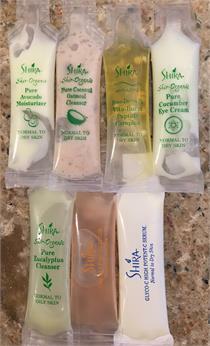 SHIR-ORGANIC & NATURAL SKIN CARE TRIAL SIZES - SHIRA TOP SELLERS! These trial sizes of our top-selling Shira Organic, Glyco-C and Boto-Derm Rx lines are perfect to try something new or for on-the-go travel.